Managing your asthma on a day-to-day basis takes time and effort, but it will give you more control of your life. It’s important to identify triggers in your environ­ment so you can avoid them as much as possible. These are the things that cause your asthma to flare up. Here are some steps you can take to minimize the impact asthma has on your life. Prepare for the season. If you have asthma, plan your most important events for summer. It’s prob­ably the best and healthiest season for you. In a study based on hospital admissions for asthma, researchers found September and October were the worst months for asthma patients. Springtime can also cause problems. Knowing this, you can try to avoid triggers and take better care of your­self during the riskiest times of the year. Watch the weather. Changing weather conditions can affect your asthma. Strong winds and changes in temperature, humidity, and barometric pressure may help trigger an asthma attack. So can weather inversions that trap pollution and ozone near the ground. Thunderstorms can be a trigger, too. In 1994, more than 600 people in England were plunged into an asthma epidemic when a high grass pollen count and a huge thun­derstorm combined to trigger asthma, even in some people who never had it before. Watch out for high pollen or pollution counts in your area, and stay inside when the numbers are large. Avoid chemical irritants. Household products such as bleach, furniture polish, paints, and per­fumes can trigger an asthma attack. Cooking fumes, especially from frying, and dusty sub­stances such as talcum powder and chalk can irritate, too. Try to get someone else in your household to deal with these products, or try to find less-irritating substitutes. Sniff out sulfites. For people with asthma, sulfites, used to preserve food and sanitize drink contain­ers, can cause a real problem. Commonly found in many supermarket foods, sulfites can trigger a severe asthma attack in someone who is sensitive to them. They can also cause symptoms such as hives, itching, flushing, tingling, and nausea. By order of the Food and Drug Administration, you can now tell whether packaged food contains sul­fites by reading the list of ingredients. Watch out for sulfites in canned and dehydrated fruits and vegetables, jams and jellies, pickles and condi­ments, fruit juice, frozen potatoes, processed seafood, soup mixes, baked goods, wine, and beer. Beware of pesky critters. If you have dust in your house, you have dust mites. These microscopic creatures leave droppings that cause an allergic reaction in someone with allergies or asthma. Dust mites live everywhere, especially in places at a low altitude or with more than 50 percent humidity. They thrive in carpet, upholstered furniture, mat­tresses, box springs, pillows, bedcovers, and clothing. The best way to defeat dust mites is to dust frequently, keep your house as free of clutter as possible, and have lots of smooth surfaces that can be easily cleaned. Vacuum frequently, includ­ing mattresses, bedclothes, and curtains. Wear a dust mask when you vacuum to protect yourself. Wash mattress pads, comforters, pillows or pillow covers, and your clothing weekly in hot water. You can also check with your local hardware store to see if they stock acaricide, a substance you can spray on carpets to kill dust mites. There is some controversy about using foam pillows instead of feather ones. Some studies say foam pillows discourage dust mites, and some say feather pillows do a better job. However, if you enclose mattresses, box springs, and pillows in airtight plastic or allergy-proof covers, that should help keep dust away from you no matter what kind of pillow you choose. Be a smoke detector. Smoke can trigger an asth­ma attack, whether it comes from a cigarette or a fireplace. Don’t let anyone smoke in your home, and avoid places where people are smoking. If you have a fireplace or wood-burning stove in your house, be sure it’s vented correctly, and use it as little as possible to avoid aggravating your asth­ma. Take care with furry friends. Animal dander is a common cause of allergic asthma attacks. If you have a beloved pet that you can’t part with, lessen his effect on your asthma by keeping him outside as much as possible. If he must stay inside, give him weekly baths to remove much of the dander that causes problems. (Check with your vet to be sure this won’t dry his skin too much.) Keep him out of the bedroom at all costs; your airways are more vulnerable to allergens at night. Have a non-asthmatic family member brush your animal out­side and clean his litter box or cage. For a dog, use washable bedding and launder it frequently. Halt your heartburn. If you’re bothered by the fre­quent burning of stomach acid up into your esophagus, you probably have gastroesophageal reflux disease, or GERD for short. This chronic form of indigestion can make your asthma symp­toms worse, or even cause them in the first place. If you have GERD, see your doctor to have it treated. You might find your asthma improves as well. At home, avoid eating or drinking for several hours before you go to bed. Try to eat lightly for your evening meal and see if your nighttime asth­ma improves. Raising the head of your bed with four-inch blocks may help your GERD as well as your asthma. If your head stays higher than your stomach, you’ll keep stomach acid in its place. Exercise anyway. You know exercise is important to your health, but you know it can trigger asth­ma, too. Be choosy about your exercise, and you can be as active as the next person. Walking, weight training, swimming, baseball, and downhill skiing are your best exercise choices. Be sure to warm up and cool down properly for every exer­cise session. This gradually increases your strength and lung capacity. Exercise in clean environments that are warm and humid. Early morning is usually the least polluted time of day in the city. On cold days, wear a scarf or face mask over your nose and mouth to help warm the air. Always breathe through your nose instead of your mouth so the air is warmed and moistened in your nasal passages. Be careful of combinations. The combination of asthma and certain medicines can be dangerous. 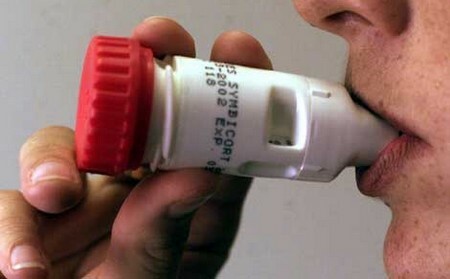 As many as 20 percent of adults with asthma have attacks from a drug reaction. Watch out for aspirin and other NSAIDS such as ibuprofen and naproxen, beta blockers, antihistamines, ACE inhibitors, and contrast dyes used for X-rays. Double check with your doctor before taking any of these, and let her know immediately if you have problems. Watch yourself carefully for any reac­tion when you start taking a new medicine. There are many things you can do to influence the place asthma has in your life. Follow your doctor’s orders, be prepared with the medicine you need, and take control of your environment so you can avoid the triggers around you. Along with your actions, keep a hopeful and positive attitude. You should be breathing easier in no time.